Gabriella Possum Nungurrayi, Seven Sisters, Courtesy Coo-ee Aboriginal Art, 2000. 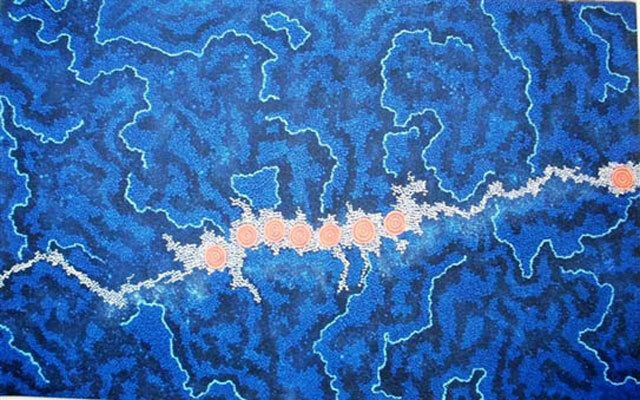 Born at Papunya in 1967, Gabriella Possum first achieved recognition in 1983 for her entry in the Alice Art Prize as a 16-year-old student at Yirara College. She learned to paint from an early age at the side of her famous father, Clifford Possum Tjapaltjarri, whose influence could be detected in her earliest paintings. From her early twenties she began to forge her own appealingly decorative and evocative style by weaving together a coherent and compelling narrative from the different iconic elements, symbols and stories of her tradition. Although her father painted principally for Papunya Tula until 1983, he largely abandoned the company thereafter and managed his own affairs. During the following decade, ‘painting business’ became a family affair. Gabriella and her younger sister Michelle assisted their father by filling in the areas of descriptive dotting on his emblematic canvasses. These ‘assisted’ canvasses brought Clifford Possum increasing worldwide recognition until they became controversial in the light of media coverage of similar practices amongst famous desert artists including Turkey Tolson and Kathleen Petyarre. By the early 1990’s Gabriella, now in her mid 20’s had given birth to the first of her children with husband Selwyn Burns, a member of the Aboriginal rock group Coloured Stone. (The band won a 1987 ARIA Award for Best Indigenous Release and Gabriella designed the record cover of their follow up album.) In 1991 she became the recipient of a Professional Development Grant from the Aboriginal Arts Unit of the Australia Council for the Arts. Her works were increasingly distinguished by the use of strong colours inspired by the dramatic contrasts of the desert landscape. Her engaging ‘Bush Tucker’ paintings were essentially Women’s Dreamings centered on Mt. Allen, the traditional country of her father. They featured a proliferation of bush foods including bush banana, coconut, plum and berries. These works also presented iconographically the tracks of women collecting food in coolamons and sitting with their legs spread, as they prepared the food for eating. By 1992 Gabriella Possum had settled with her growing family in Broadmeadows, on the outskirts of Melbourne. She and her father exhibited in Sydney at Coo-ee Gallery that year before creating works that were exhibited in the USA and throughout Europe. She participated in Modern Art-Ancient Icon (1992) and Down Under (1993) while completing commissions for posters, clothing designs and licensed merchandise. At this time she began to develop the imagery for which she has become best known, the Seven Sister Dreaming that traces the movement of the Pleiades and the Morning Star as they journey amongst the constellations of the Milky Way. The work illustrated is an excellent example. Measuring 111 x 180 cm, it was created in 2000 two years before her father’s death. The songlines of the Milky Way travel from the far northern reaches of Arnhem Land, down across the continent through Central Australia and beyond. In the version painted by Gabriella Possum the Sisters traveled over a vast expanse of country, followed by a man called Wati-Nyiru of the Tjakamarra skin group. He disguised himself, appearing in many different forms to deceive them. The Seven Sisters escaped through a fire at Kurlunyalimpa to the Milky Way where they became the stars of the Pleiades in the Constellation Taurus. Wati-Nyiru followed them to the heavens, and became the Morning Star in the constellation Orion. In her renditions of the story, Gabriella recreates the desert night sky with its luminous heavenly characters suspended in the deep blue of space. The Milky Way is depicted as clouds of softly glowing stars, with the major characters in the narrative appearing as singular stellar ‘landmarks’ that emerge from dark empty spaces. In the finest of these works Gabriella demonstrates all of the skill and technique she learnt sitting at her father’s side watching him vary his palette and variegate the margins of his dotting in each complimentary colour. Gabriella Possum has always worked for independent dealers. Since the mid 1990’s these have principally been located in Melbourne and include Peter Los, Des Rogers and Adam Knight, owner of Aranda Art Gallery. In 1999 she painted in the foyer of the United Nations, accompanying an exhibition of Western Desert paintings and since that time has painted in Melbourne exclusively for private dealers who have arranged for her participation in a number of events in Australia and overseas. In 2008 Adam Knight of Aranda Aboriginal Art commissioned Gabriella to create a 20-metre art installation depicting her custodial Grandmother's Country for Jamie Durie’s display at the 2008 RHS Chelsea Flower Show in London. When awarded the gold prize by HRH Queen Elizabeth, Durie presented the Queen with an original work by the artist, completing a unique achievement. The work now hangs in the royal collection along side that of her famous father. In July 2008 Melbourne dealer Peter Los organised a sale of Australian Aboriginal art at the Hôtel Dassault in Paris through the French auction house Artcurial. In a sale that had mixed results Gabriella Possum’s Grandmothers Country was one of the star lots when sold for €24,784 (equivalent to approximately AUD$48,000). Incredibly, eight of the artists ten highest results at auction have been achieved by Elder Fine Art in Adelaide which has, in fact, sold no less than 20 works for a total of $118,332, while Joel Fine Art have sold 23 for $54,503. No other auction house has sold more than three works and Sotheby’s have sold none. This is especially interesting as Gabriella Possum’s results at auction are impressive and her lineage ‘royal’. Between 2005 and 2007 no less than 37 works were offered of which 31 sold for a clearance rate of 84%. The sale in Paris that set her career high of $48,000, corresponded to a period of serious ill health during which the artist seemed unlikely to recover. Yet she has done so, and is now continuing to create works of great beauty, albeit not as fine as those created during the previous decade. With the narrow range of provenance currently accepted by Sotheby’s, Deutcher and Hackett and Mossgreen it is unlikely that an artist, even of Gabriella Possum’s lineage and talent, who has worked independently and eschewed exclusive contracts with any one gallery, will get a guernsey. Yet her works are held the National Gallery of Australia, the Art Gallery of South Australia, Flinders University Art Museum, the Holmes a Court Collection, and the Kelton Foundation in Los Angeles, USA amongst many other fine collections. Given the current market slump, collectors keen on her works may well be able to pick up a bargain at the moment. But note: if you are keen to buy, be quick about it. Gabriella Possum is a seriously talented painter even if her Bush Tucker works seem slightly generic to those collectors mesmerized by the optical and minimal. Her cosmic Seven Sisters paintings are worth far more than the market currently demands. They are unlikely to remain as inexpensive once the Aboriginal art market begins to regain traction.